It’s T’Challa‘s 35th Anniversary, and The House is celebrating with a special edition 100-Page Monster! Part 1 of “The Once and Future King” takes us 25 years into the future, to a time when Wakanda has returned to an isolationist policy. And when Secretary of State Everett K. Ross is kidnapped by enemies of the African nation’s king, T’Challa refuses to come out of seclusion, even to save his old friend! And so it will fall to the king’s daughter, a child he has rejected all her life, to journey to America and take on a baker’s dozen of T’Challa‘s deadliest foes, and to win her father’s love! In the future T’challa king of wakanda has returned to the ways of his father T’chaka. Wakanda is once more isolated and borders closed. He has vowed never to set foot in America again. He has also been married twice; once to long time love Monica Lynn with whom he had a daughter Faida who he does not acknowledge and Queen divine Justice who had a son T’charra who he adores. In America Everette Ross is captured. T’challa is notified but knows nothing. His daughters teams with Uncle Hunter to find him in hopes of winning favor for herself. 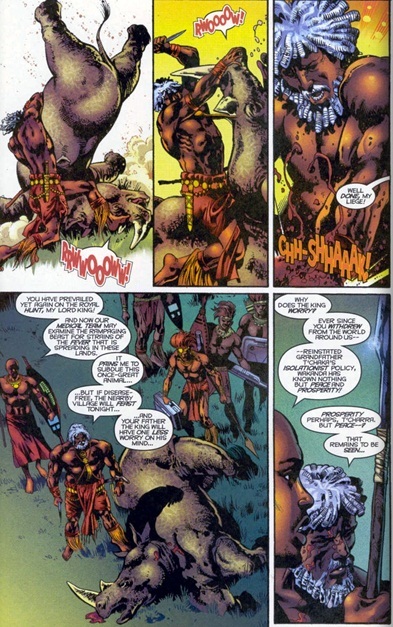 Just as they reach Killmonger to rescue him, T’charra arrives and kills, Killmonger, Hunter and apparently Faida. In wakanda T’challa moves into action by donning his costume and in America Achebe arrives. Art- Valluto and Bob Almond turn in great work on art duties. Distinct though not very stylized. Colors all add a welcome contrast to the otherwise sombre tone of the book. What if- I love me a good tale of the future. And here preist unfolds the future of his run on the Black Panther. Far different than Hudlin’s more optimistic future this one is filled with Preist’s trademark deceit, plans within plans and humor. Faida is undoubtedly the star of this issue with her colorful history! Dressed as a young queen divine justice and apparently grown as her daughter while biologically the daughter of T’challa and Monica Lynne; the divorced former queen. She was also trained by uncle Hunter of the Hatut Zeraze. To say she has a bounty of stories to tell is the understatement of the year! In terms of personality she is also highly reminiscent of her father. 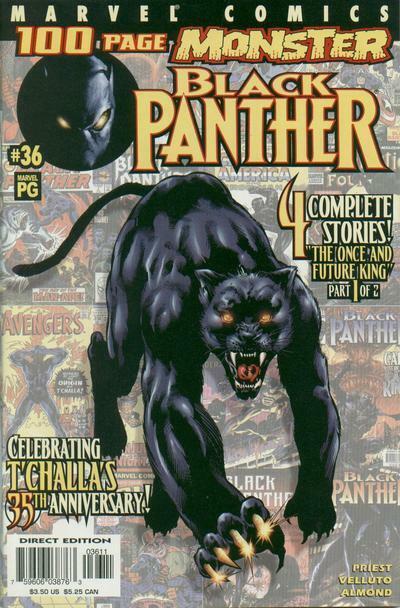 Cover– A great panther with golden claws in the foreground while back issues of the previous thirty five years hang in the background. Decent looking and filled with Nostalgia though not the best Ive ever seen. Nostalgia- It was cool seeing long forgotten villains like Baron Macabre, Venomm, Lord Karnaj, Madame Slay, Sombre and Salamander K’ruel. All have been forgotten by time. Note even Hudlin apparently thought enough of these guys to use them in his run or anyone right up to June 2012. Too much- Allot took place in this issue making it a bit heck tick for new readers and the genealogy of his children was a bit confusing to figure out.